SEA COW’S BAY, Tortola, VI - Two tourists, one male and one female, were injured after being involved in a scooter accident today April 29, 2014 in Sea Cow’s Bay on the Main Island of Tortola. 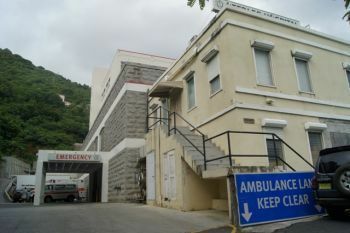 The two persons were said to be riding down a steep road called Thread Falls Road or 'Elevator Road' when the rider lost control of the motor scooter causing them to run off the road. According to reports, the female received the brunt of the injuries. Police are said to be investigating the incident and could not be reached for comment. Bigger bikes are not needed. They need to each be on their own scooters so the weight is not too much t o hold brakes going down hills. Also that hill is really steep even for cars. That road needs a few signs at the top and bottom of the hill indicating the type and steepness of the hill ahead. Once, was one too many times. Twice is just ridiculous. Residents know the hill and some avoid it. Tourist don't have a clue and need some sort of forewarning to take precaution or find alternate routes. I use the road every day and if it were repaired properly so as to be able to handle the 10 -20 Concrete trucks that go up the road, it would not be a problem. Signage would help to, along with slow driving and pushing the horn on the sharp corners. That hill needs to be cut down and paved properly. I come down that hill practically every day, and even in low gear I am anxious. There also needs proper signage advising users of the road about the steep descent of that hill.. That road is in total disrepair, with jagged edges and holes, and spilled concrete that has hardened, making it difficult to navigate even for me who uses it all the time.